Brussels sprouts have experienced a revival lately. 20 years ago, when I was 8, I would have looked at you and said “No way, José, am I eating those things!” They were leafy, green, and smelly. Gross. However, over time, tastes change and Brussels sprouts have become one of my favorite vegetables to make, especially as an easy and nutritious side dish during the holidays. It’s a brand new day for every child’s least favorite vegetable. Here is the recipe used by JUP Mama (my mother) to make simply THE BEST Brussels sprouts you could ever ask for. It was created by Amanda Finks and was featured on her blog, The Wholesome Dish. The first, and most labor intensive step, is to cut the sprouts at their base and peel off the outer leaves. Next, cut each sprout in half. Be sure to wash the sprouts and wipe off any dirt or residue on the leaves. Once the sprouts are squeaky clean, transfer them to a large bowl. Once you have added the oil, salt, and pepper, gently toss the ingredients until the sprouts are thoroughly coated. Next, spread the sprouts evenly on a baking sheet. I like to use my Pampered Chef large Stoneware bar pan. It ages like an iron skillet. Sorry, I just couldn’t resist a close up. Roast the sprouts for 15 minutes. Then, stir the sprouts, flipping over as many as you can. Drizzle the sprouts with maple syrup. Note: I did not drizzle the syrup straight from the bottle. That could have been disastrous! I’m holding the bottle here for the sake of taking a picture. 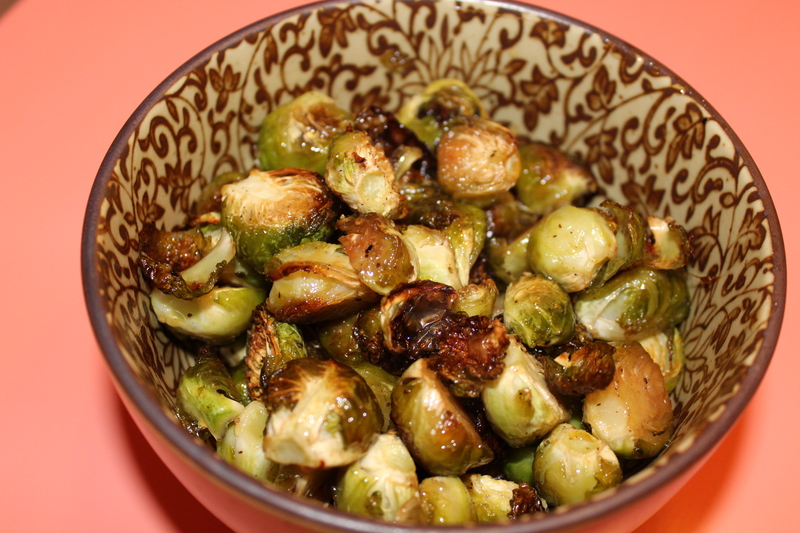 Return the Brussels sprouts to the oven and roast for another 8 – 10 minutes, being careful not to burn them. The sugar from the syrup will caramelize the outer layers of leaves exposed to the heat. Voila! Nutritious and tasty vegetables are served. Thanks JUP Mama for finding this excellent recipe on your quest to cook healthful and organic foods for your family. We love you for it. Nice recipe! I also add some coconut sugar (or brown sugar) to get it even more caramelized… but I also add cayenne pepper too so the added sugar helps level out the heat. Nice pictures too! Well done, Em! Thanks Leah! I’m sure Patrick would love the Cayenne pepper. I will have to try that next time!! Maple Syrup!? Oh yah. Gonna need to try this. Oh yes, it’s delicious! Let me know how you like it!